When we have any driving trip, I always find natural places to stop and stretch our legs. State parks, wildlife refuges, swamps, preserves, gardens. Whatever will delight us and get our mind and energy back to hit the road again. 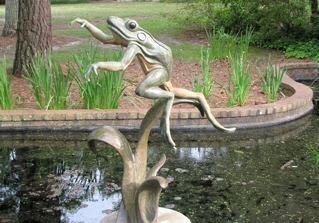 On our recent trip to Florida, on the way down, we stopped at this park because I love sculpture. My favorite one was titled, "Hop To It" by Kim Shaklee. A 53" bronze Southern Leopard Frog, which is a local resident of Summerville, SC. View photos here. There were more sculptures that we did not see on the another part of the trail. You can download the Azalea Park brochure in PDF format for more information. The photo(s) and article are copyrighted. You may use either of them if you include the following credit and active link back to this website: © 2010 Donna L. Watkins - This article was reprinted with permission from TheNatureInUs.com. The link to use is: www.TheNatureInUs.com. Aphids Gobbled Up and All Gone!